Not to put his business out there, but my husband is not a fan of spinach. Stubborn that I am, though, I try to work it into dishes to “convince” him that maybe, just maybe, there is requited love out there for him and the leafy greens. You see, I didn’t always adore spinach myself. When I was in preschool, I once had an abysmal lunch of macaroni and cheese (yum!) with canned spinach (ugh!). When I refused to eat my spinach, I was told that I couldn’t have any chocolate pudding for dessert. This was no matter in that I didn’t like chocolate (don’t really love it to this day unless it’s really, really good) – I pitched a fit and refused to eat the vile spinach. With that, I was whisked off to timeout and my hatred of spinach was sealed. Until…I decided to study Italian in high school before heading off across the pond for a school trip. As we learned the different food names in Italian, a group of us made a face at spinaci. “Oh no!” our professor assured us, “Fresh spinach sauteed with olive oil, garlic, salt and pepper is delicious! You must try it.” Try it, I did, and I never looked back – spinach and I were meant to be together. Fast forward many years later, I found myself tinkering in the kitchen with ways to get Dennis to reconsider spinach. Aside from a successful batch of Swiss Chard and Sweet Pea Manicotti, the only other winning recipe integrating greens into a palatable dish for the hubs is this cheese pie. 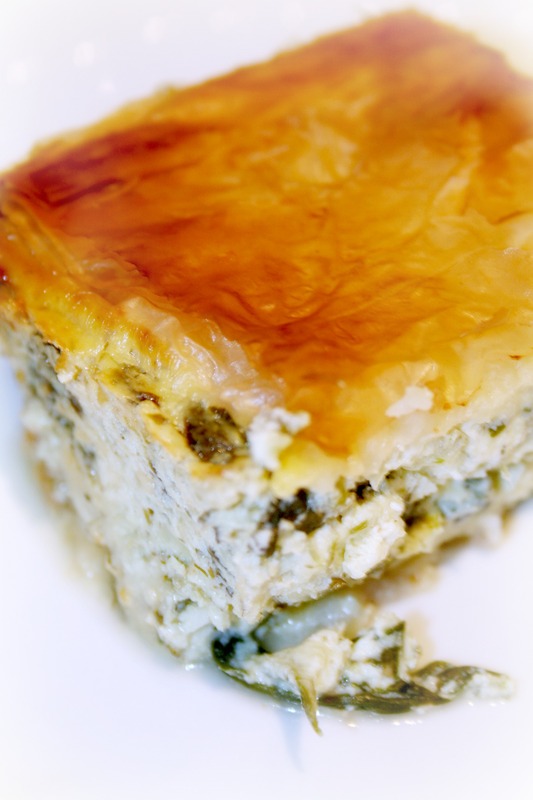 It’s a ramped down spanikopita that is enlivened by a plethora of cheeses – feta, ricotta, cottage and parmesan turn into a lovely filling for crisp and buttery sheets of phyllo dough. It’s really a remarkable feat how a carefully constructed dish has the potential to make someone reconsider their tastes. Here’s to training one’s palette to the utmost of discernment. Oh, and spinach pie – here’s to spinach pie! In a standing mixer or large mixing bowl, blend together the ricotta, cottage cheese, feta, locatelli and eggs. Mix in the remaining ingredients except for the butter and phyllo. Grease a 13 x 9 x 2 in baking pan. Working carefully and quickly, lay out a sheet of phyllo and butter with a pastry brush. Keep on alternating melted butter and phyllo until you have laid down half of the phyllo. Pour the spinach and cheese mixture on top of the phyllo. Top with alternating layers of phyllo and butter. Once you’ve finished with all of the sheets, cut the pie into squares before baking. Place in the oven and bake on 350° for 45-50 minutes. If the top starts to get too brown, cover with foil for the remainder of the cooking time. Let sit for around 5 minutes before cutting. Serve to spinach lovers and skeptics alike.